In previous posts I have mentioned how necessary it is to observe the provenance of an item of jewellery in order to be able to label it with certainty as ‘suffrage’. In that way the collector is less likely of falling into the trap of buying an item – vaguely Edwardian with vaguely purple, white and green stones – that an auction house or dealer has chosen to label ‘suffragette’ In this post I will bring to your attention three items of jewellery – made for two Dublin sisters – that are indisputably ‘suffrage’. ‘Margaret’ and ‘Jane Murphy’ were the pseudonyms of two middle-class women from Dublin – whose real names were Leila (b. 1887) and Rosalind Cadiz (b. 1886). They were members of the Irish Women’s Franchise League. They both took part in the window-smashing campaign in London in March 1912 and were sentenced to two months in Holloway. They went on hunger strike (c 16 April) and were forcibly fed. They were released c 15 May. The pendant above is engraved – “Holloway Prison No. 15474, Maggie Murphy, 2 months hard Labour, E.4 Cell.12., Hunger Strike 16th April 1912, Forcibly Fed – and was made by the suffragist and enameller, Ernestine Mills. 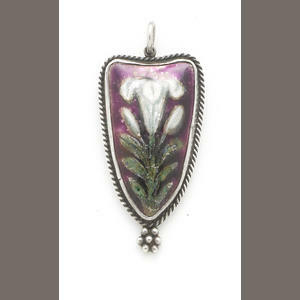 As you can see the lily motif is rendered in purple, white and green – in this case a ‘true’ use of the colours. 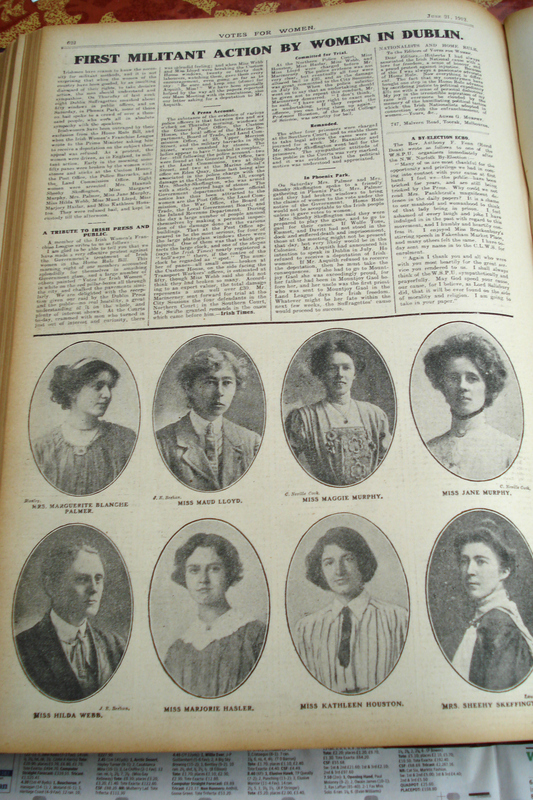 Margaret and Jane Murphy, top row far right and second from right, pictured in Votes for Women, 25 June 1912. A couple of months later the Murphy sisters took part in the first window-smashing campaign in Dublin and were again sentenced to two months’ imprisonment – but in Dublin they were given the status of political prisoners. The Murphys eventually succeeded in not only getting a suffragist doctor, Kathleen Maguire, to treat them, but also in getting their own dentist. ‘Miss Jane Murphy will attend her own dentist at her own expense’ (July 1912). The Murphys clearly had a way about them for ‘with reference to Margaret Murphy’s complaints of the possible effect of the whitewashed walls of her cell on her eyes, the governor agreed to have the walls recoloured, and to have a new gas burner fitted in lieu of the existing one, and her request for a special kind of disinfectant to be used in her cell was referred to the Medical Officer.’ 25 July 1912 Minutes of Mountjoy Prison. Finally the sisters went on hunger strike for the last 92 hours of their sentence (along with 2 other Irish suffragettes) in sympathy with three English suffragettes (Mary Leigh, Gladys Evans and Jennie Baines) who had received harsh prison sentences in Dublin and who had not been given political prisoner status. The Murphys were not forcibly fed – the end of their sentence arriving before this became necessary. They were released, together, from Mountjoy Prison on 19 August, welcomed by members of the Irish Women’s Franchise League. Here are the pendants that the sisters either commissioned for themselves or, more likely, with which they were presented after their release. 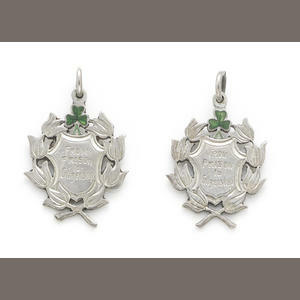 Each pendant is of shield shape, surmounted by a green enamelled shamrock, hallmarked Dublin, Hopper and Hannay, 1912. One is engraved on the obverse “From Prison to Citizenship” and on reverse “J. Murphy 20.6.12 to 19.8.12” and the other “M. Murphy 20.6.12 to 19.8.12”. Thus do three items of jewellery commemorate the efforts of two Irish sisters to win ‘Votes for Women’. This entry was posted on August 27, 2012, 6:21 pm and is filed under Collecting Suffrage, Suffrage Stories. You can follow any responses to this entry through RSS 2.0. You can leave a response, or trackback from your own site. I like the pendant very much, and not just because of the purple, white and green. Rather all the suffragette jewellery I have seen has been produced in large numbers and not very personal. Your pendant seems to have been specifically made for Margaret Murphy, reflecting her personal experience in the movement and her nationality. Many thanks for this further information on the Murphy sisters. I am a family member of these women and am looking to learn more information about their lives. I was wondering if there were any places you managed to find information and if you know anything else? Actually, I think she was actually Dr Katherine Maguire (my mistake to rename her Kathleen). If you google that name either in a straightforward Google search or in Google Books you’ll come up with some useful references you can follow up. These two women are actually my great aunts, which is something that I am very proud of. My family owns Rosalind’s suffragette certificate and a few other mementos, but I really want to eventually track down all of their medals and pendants and possibly purchase them from their current owners. Would you know how I might go about this process? Rachel ~ I am afraid that I am not at liberty to disclose the identity of the buyer of the Murphy pendants that passed through my hands a few years ago. Dealers do have to be discreet…I am sure you will understand. I completely understand the need for discretion. Is it possible for me to provide you with my details, for you to pass onto the buyer?